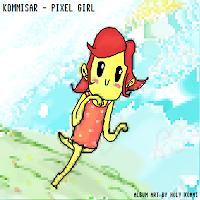 Bringing his second release to Pxl-Bot and also our 10th release, Kommisar returns on his usual fantastic form. His usual melodically focused memorable chaos has returned, this time with a slightly darker twist to compliment the increase in range of this astonishingly fresh artist. Rarely does an artist produce so much material this regularly that seems this new and original each time round. From the very beginning Kommisar breaches new heights of structural and musical complexity and achieves so with apparent ease whilst still managing to lodge his hefty melodic hooks in your cortex. Featuring an Iron Maiden inspired chip re-imaging, a vs track with Zaghurim on the release closer and a return to his classic track “La Lune du minuit éternel” this is Kommisar’s most accomplished and broad release to date. We here at Pxl-Bot are once again very proud to bring you another release by this Chip God. We hope you enjoy it as much as we did! Grab The ZIP Now!